Moeen looking for man most likely for England here. He's making things happen at least. Mathews has a hack out to deep midwicket, but the ball bounces short of Ballance on the fence. Wheels coming off all over the place now. 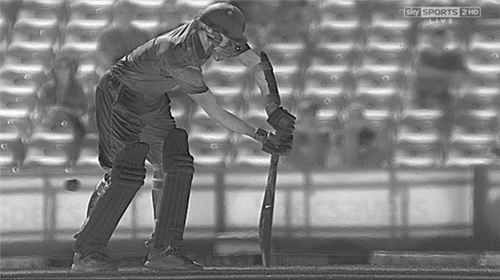 After five dot balls to Mathews, Broad goes round the wicket with Prior stationed down the legside. Fairly clear what the plan is. Broad then bowls it so far down the legside that Billy Bowden rightly calls a wide. Mathews gets bat on the next one and gets the single to keep the strike anyway. England have spent 30 overs more interested in getting Herath on strike than getting Mathews out. The result: 112 runs, and no wickets. Mathews continues to play beautifully, cracking Moeen to the point boundary as he drops short. [nasserhussain] This has been a lesson for England, not having a frontline spinner. A Test match pitch can change a hell of a lot over five days. You have got to have a balanced attack, and I don't think this is a balanced attack for England. Herath able to get off strike first ball from Anderson with a scampered leg-bye. England then do at least try something approaching a plan to Mathews, packing the offside and bowling outside the off stump. Off theory. Doesn't work. Anderson penalised for bowling too wide of off stump by Billy Bowden, and then sliced over backward point for four by Mathews. The 400 is up for Sri Lanka as Herath lunges forward and hammers a powerful sweep shot off Moeen to the square-leg fence. Plumb if he missed it, but it screamed off the middle of the bat. Mistimes a pull shot from the last ball of the over and can only get a single so will keep the strike. 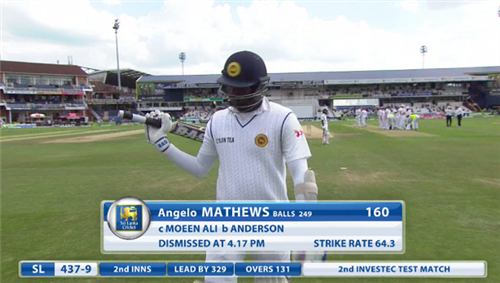 The lead climbs to 300 as Herath pulls Anderson down to the fine-leg fence and then edges wide of the slips. Big appeal for leg-before to end the over, but it's sliding way down leg. 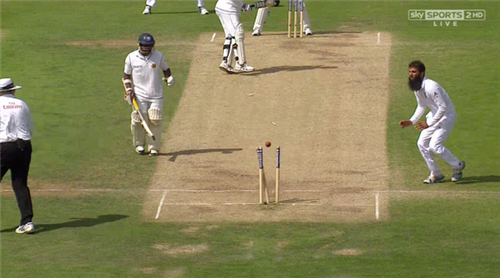 Mathews gets four with a fine leg-glance before leaving Herath one ball to survive against Moeen. Again, he does so, getting outside the line to cut England's lbw appeals short. Mathews still not giving Herath any strike in the early part of the over, and justifies the decision by steering the fifth ball in one of the small gaps between three fielders behind point and collecting four. [wicket]Nine runs off the Moeen over before Mathews stitches Herath up. He's looking for a quick single off the final ball of the over but it's not there. Sends Herath back, but too late. He's stranded mid-pitch as Root throws down the stumps from mid-on. 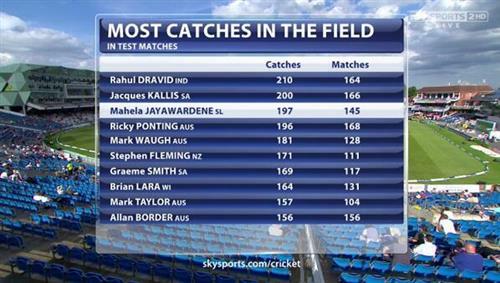 [davidlloyd] Those two (Mathews & Herath) have given England a massive headache. 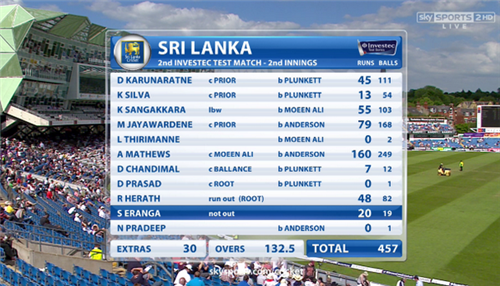 They'll be glad to get in with Sri Lanka holding a fantastic lead of 318 at tea. Success right at the end, then, of a truly abysmal session for England. Mathews magnificent for his unbeaten 149. [tea]An England win still looked the likeliest result at lunch. One astonishing session later and it might even be the least likely. Mathews and Herath have demolished England in that session, one in which their bowling, fielding and captaincy have all been horribly, mercilessly exposed. Eranga is on strike after tea and avoids a 'king pair' (he got a first-ball duck in the first innings) with a calm back-foot defensive shot to Anderson's first offering. Not out! England are convinced they have got Eranga caught behind from the final ball but umpire Billy Bowden keeps his finger down - and England are out of reviews. Replays show a clear edge. Anderson couldn't even bring himself to go and collect his cap from Bowden, who has to wander down to mid-pitch and hand it to him. England paid the price for wasting their two reviews earlier on; particularly the Anderson-Chandimal lbw shout this morning which was going waaaaay down leg. Mathews moves to 150 with a single into the leg-side off Moeen. The body language between Anderson and Bowden is tremendous, the bowler can barely bring himself to look at the umpire. Mathews keeps the strike with a single behind square on the off-side from Anderson's final ball. Mathews advances to the fifth ball of Moeen's over and lofts his drive one-bounce for four to straight midwicket. He takes a wild swing at the last delivery and is fortunate when an under-edge runs away for a single to fine-leg. Sri Lanka riding their luck since tea. A wonderful innings ends with a poor shot, hitting a full toss to midwicket. Mathews is applauded off the field by the Headingley crowd. He faced 249 balls and struck 25 fours and a six. A masterpiece of batting with the lower order.